Have you ever been in a pose and your yoga teacher came along and said one tiny thing to you or gave one little adjustment to you that changed the entire pose and made it feel better and way more possible? Sometimes that moment feels a little bit magic. Though it’s kind of fun for people to think we are psychic wizards, here’s the truth: yoga teachers aren’t magicians. Teachers that study alignment-based yoga have systems of understanding the mechanics of the body, and there are reasons why that little adjustment made all the difference. When applied carefully, and in sequence, these biomechanical principles can help make an impossible pose feel more doable, help you stabilize when you feel you’re about to collapse, or help you open up just a bit deeper in a pose. In a survey of our 2014 teachers-in-training, we asked: What are the most helpful things you’ve learned so far in the training? The most common response was: Learning about the Loops! The 7 Loops (which are a foundation of alignment methodology from Anusara Yoga), are a concept that help us align our body and support key joints and junctures in the body. 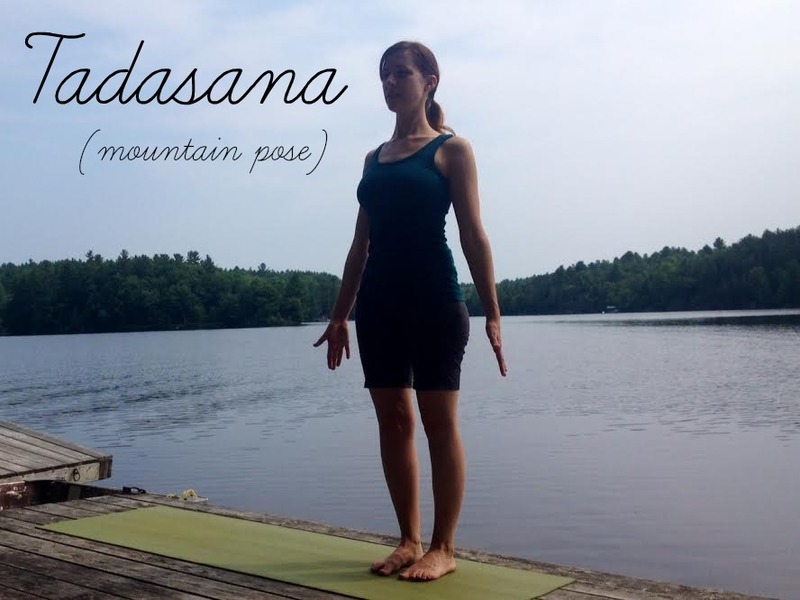 The the aim of Mountain Pose (Tadasana) in our yoga practice is to find equal standing (Samasthiti). The knees are stacked over the center of the ankle, the pelvis is centered over the legs, the spine is elongated with its natural curves, and the head is centered on top of the spine. When our bones “stacked” in this way, then the force of gravity moves through down a central vertical axis evenly, our joints can decompress and our muscles can be fairly relaxed. This all s ounds ideal, but finding that vertical alignment can be tricky. The loops give us a map for doing that. 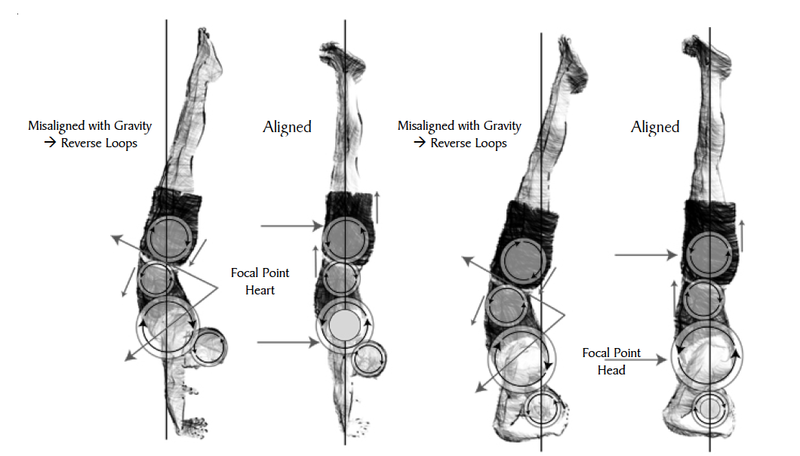 “Located in the sagittal plane of the body, the loops reestablish proper alignment with gravity and culminate in organic extension through the core lines of the body,” writes Doug Keller. You can see the upper body loops showing the head balanced over the spine in the drawing to the left. One of the most common areas where we tend to deviate away from the optimal vertical line day to day, is in our neck and head. When we’re not conscious of it, in many positions we spend hours in each day (sitting at your computer, commuting in your car, even just standing in line or sitting with a friend), we thrust our heads forward of our spine. (You are probably reading this on a computer or a smartphone right now – Notice: is your head forward of your spine in this moment?) This is so common and causes so many postural issues, physiotherapists have given it a fancy name, “Forward Head Position” (FHP). The issue with FHP is that your head is quite heavy, around 10 -11lbs. When the spine is in good vertical alignment the neck and upper back muscles just provide a bit of stability and movement, but if your head is often forward from neutral, even one inch, this starts to put a huge strain on the muscles of your neck and upper back. Overtime this can result in chronic pain and tension in your neck and shoulders, and even problems in the discs of your spine. That pain in your neck is there for a reason, it’s trying to remind you to realign your spine! Having an understanding of the loops, and feeling how they work in our yoga asana practice can help us strengthen and stretch more safely and intelligently. This understanding can sometimes provide the key for unlocking a difficult pose. With a bit of understanding of biomechanics, rather than that opening in a pose being a fleeting magical moment, we can better align our joints, create a balance of stability and stretch, and go a little deeper each time we get on our mats.